"Fast to set up, fast to tear down"
PRESS RELEASE: The name Fastpack says it all; easy to get into the gig, fast to set up, fast to tear down, and easy to load out. The Mapex Fastpack drum set has a special Birch and Basswood shell that delivers a wide range of sounds and because the sizes are not miniature the tone and projection can support any music situation. 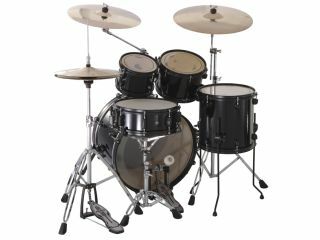 This compact configuration has a 20"x12" bass drum, 8"x6" and 10"x7" mounted toms, 12"x12" floor tom and 13"x5" snare drum. Mapex added the new 310 series single-braced hardware and a B53 boom cymbal arm all designed for easy lightweight portability. With functionality being key to the Horizon Fastpack every detail is considered, right down to the bag set. With only two drum bags carrying all the shells and one rolling hardware bag, there has never been an easier way to make your life easy whilst sounding as good. The Mapex Fastpack set lets you spend more time making music with your drums and less time moving them.